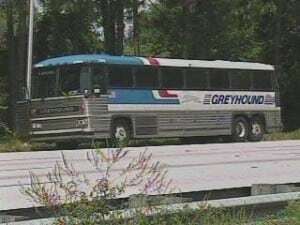 DUI Orlando – A Greyhound bus driver with 39 passengers on board was arrested on Sunday by the Florida Highway Patrol on the charge of DUI. According to the report, a 911 call was received by police dispatch made by a passenger on the bus as it was driving south on Interstate 95 near the Daytona Beach area. The caller told dispatch, “We’re on a Greyhound bus and the driver is reckless driving.” “He’s fidgeting. He’s been fidgeting for about an hour-and-a-half now. He almost ran a car off the road.” “He keeps putting his head on the steering wheel and bringing it back up and jumping in his chair,” the caller said. Deputies and FHP troopers pulled the bus over after it continued to travel some 30 miles after the 911 call was placed, reaching speeds of nearly 70 mph and drifting into the shoulder of the roadway. Richard Campbell, who police identified as the driver of the Greyhound bus was given field sobriety tests at the scene of the stop. After Mr. Campbell failed the DUI field sobriety tests, he was arrested and charged with DUI. Campbell was taken to a local hospital, where he spent the last two nights. Greyhound Bus Lines told Local 6 they have a “zero-tolerance policy” when it comes to substance abuse, but wouldn’t comment further.